TEN TECH LLC will be a Corporate Sponsor and Exhibitor at the Military Systems Conference. 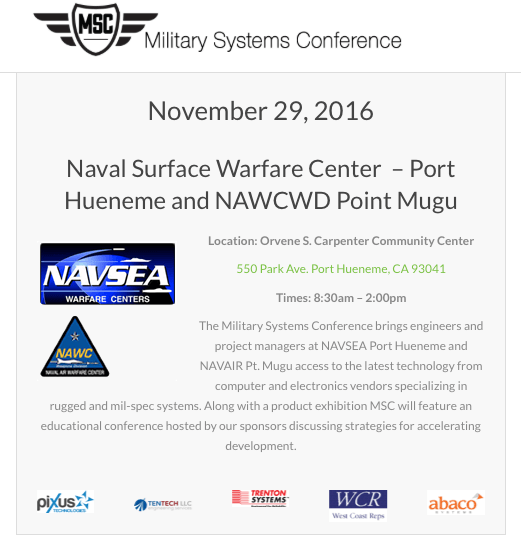 The Military Systems Conference brings engineers and project managers at NAVSEA Port Hueneme and NAVAIR Pt. Mugu to access to the latest technology from computer and electronics vendors specializing in rugged and mil-spec systems. Along with a product exhibition, it will also feature an educational conference hosted by our sponsors discussing strategies for accelerating development. Come join us on November 29, 2016 at the Orvene S. Carpenter Community Center, 550 Park Ave. Port Hueneme, CA 93041.